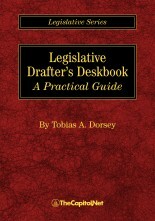 A "how to" program for anyone who drafts federal legislation. Availabe as a public, open enrollment course, as a sponsored course, and as custom on-site training. Available as a sponsored course and as custom on-site training. 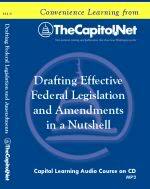 "Drafting Effective Federal Legislation and Amendments in a Nutshell," a Capitol Learning Audio Course on CD with Frank Burk (Legislative Counsel of the U.S. Senate 1991-1998). Save more than $20. Free Shipping. Don't see the course or topic you need? See what previous attendees say about our training. Bring these courses to your site. These Legislative Drafting courses and any combination of their topics are available as custom on-site training for your organization. 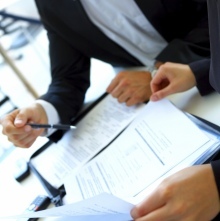 We have tailored our writing courses for attorneys, program analysts, lobbyists, paralegals, Inspector Generals, legislative assistants, and others. For more information about how our training can help your members and staff, please contact our client liaison.